Good. Book. 8vo-over 7¾"-9¾" tall. A little wear/light creasing to the cover edges and surface and the page edges have a hint of a tan. Otherwise in good condition. The pages are extremely clean and bright and there are no inscriptions. All my books are carefully packed and I make every effort to despatch orders the same day. If you have any questions regarding this book, or wish to see a picture before you buy, please do not hesitate to ask. Very good. 101 Dalmatians by Walt Disney. Good. 101 Dalmatians by Walt Disney. Very Good. 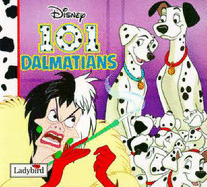 101 Dalmatians (Disney Classic Series. ) by Walt Disney, 1992-09-24. Sewn binding. Paper over boards. Intended for a juvenile audience. All Editions of 101 dalmatians.